Kicking off the spring season Spanish style, Bistro Off Broad, the chef-driven dining destination located in historic downtown Winder, Georgia, is hosting a Spanish Tapas and Paella Night on Wednesday, April 17, 2019. 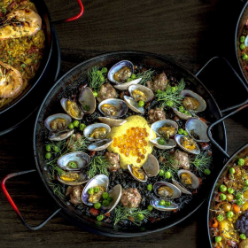 Beginning at 5 p.m., diners and imbibers are invited to celebrate the art of Spanish cuisine with an array of well-seasoned specialties created by award-winning Executive Chef Alex Friedman. Tickets are available for $35 per person and reservations are encouraged. To make a reservation, call 678.963.5517 or e-mail bistrobroad@outlook.com. For more information, visit www.bistrooffbroad.com.